The Parlour Inn is a hotel conveniently located in the heart of beautiful Stratford, Ontario, Canada and is walking distance to the Stratford Festival theatres. 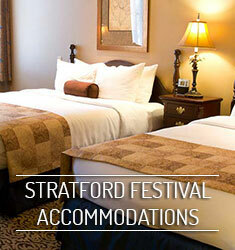 Our Stratford Festival hotel accommodations enable our guests to make the most out of their theatre getaway. Relax as you grab a bite to eat at our in-hotel restaurant, The Parlour Steakhouse, and unwind with our extensive wine selection from some of Ontario’s best wineries. Then take in Stratford’s infamous gardens during your strolls to the plays, musicals and productions of the Stratford Festival. The Parlour Inn is the best spot for you to create the perfect date night or evening out with friends when you’re visiting Stratford, Ontario…where the swans are plenty and the culture is always lively. The Stratford Festival allows theatre-lovers from across Ontario to indulge in exceptional theatre performances and world-renowned plays and productions. Always an exceptional event, this year’s playbill promises to be an absolute favourite for this year's festival attendees. From classical Shakespearean dramas to re-energized contemporary pieces, long-time fans of the theatre, as well as new visitors will fall in love with the acting, the costumes, stage designs and productions that this infamous Ontario theatre festival has to offer. 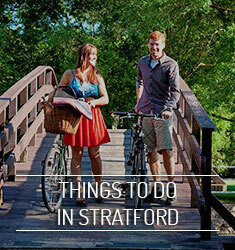 The Stratford Festival runs annually from April through to November. During this time, theatre companies will put on over a dozen impeccable works between the five Stratford theatres. The Parlour Inn is located just steps from each of the theatres, so our guests never have to worry about struggling to find parking prior to their show, making The Parlour Inn the ideal Stratford Festival hotel. Each production that runs during the Stratford Festival is uniquely wonderful which is why we recommend that you include more than one play during your Stratford Festival getaway to make the most of your experience. 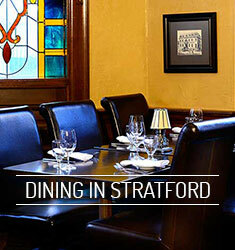 Choose The Parlour Inn for your Stratford Festival accommodations – just 10-minute walk from the Stratford theatres. Enjoy a getaway that includes a world-class theatre experience, an exceptional steakhouse and noteworthy service. Make it a theatre-filled weekend or return time and time again to relive your fun-filled experience in Stratford, Ontario and the new plays and productions. Our friendly and informative staff members will always be happy to welcome you and your loved ones back to The Parlour’s upscale hotel rooms and restaurant. The 2019 season of the Stratford Festival is set to begin in April. 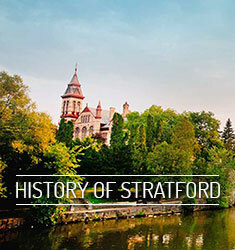 Below is a schedule of the official 2019 Stratford Festival Performances and plays to experience in the charming town of Stratford, Ontario. See how international dance sensation, Billy Elliot, overcame insurmountable odds to dance his way to stardom. This heart-warming musical includes music by Elton John and thoughtful choreography that will have you on the edge of your seat as you cheer Billy along his brave adventure of chasing bold dreams. Visit the official website for Billy Elliot for more information and to purchase tickets. Romance can take a lot of twists and turns – especially when divorce and honeymooning with new spouses are involved. Watch as Elyot and Amanda attempt to navigate a hilariously awkward reunion after five years of separation. Will the old/new couple make things work the second time around? Cast: Lucy Peacock as Amanda Prynne, Geraint Wyn Davies as Elyot Chase, Sarah Dodd as Louise, Mike Shara as Victor Prynne, Sophia Walker as Sybil Chase, and many more! Visit the official website for Private Lives for more information and to purchase tickets. This lively classic seamlessly incorporates the unlikely combination of horror and romance to create a sixties-inspired comedic uproar. Watch as the unlikely hero Seymour Krelborn attempts to show his love for his sweet colleague, only to discover he’s grown more than just feelings! Great special effects, upbeat music and a fun plotline make this show an absolute blast for audiences of all ages. Visit the official site for Little Shop of Horrors for more information and to purchase tickets. Othello is a beautifully tragic representation of what happens when we allow nefarious beings to poison us against our loved ones. Watch Othello’s heart-breaking downfall as he becomes victimized by a Machiavellian figure who is set on his demise – no matter the cost or consequences. Visit the official website for Othello for more information and to purchase tickets. History is made when King Henry VIII decides it's time to end his marriage to Katherine of Aragon in favour of marrying a younger and, most importantly, more fertile woman. William Shakespeare creates an emotional spectacle by combining love, lust, rage and violence in this historical production. Visit the official Henry VIII website for more information and to purchase tickets. Get ready to smile until your cheeks hurt as you witness two empowered women thwarting a philanderer’s attempts to seduce them both at the same time. This small-town comedy, set in the 1950s, is perfect for a girls’ getaway where the focus is on feeling good while getting up to no good. Visit the official website for The Merry Wives of Windsor for more information and to purchase tickets. Revisit and recreate the magic of childhood wonderment as you follow ten-year-old Bastian into a world of mystery through his new favourite book. This family favourite will keep you on the edge of your seats while delighting you with stunning special effects and enchanting talent. Visit the official website for The Neverending Story for more information and to purchase tickets. Have you ever heard of Bloody Mary? This production will help you understand how King Henry VIII and Katherine of Aragon’s daughter took the throne and transformed her kingdom into one gripped by fear and the threat of turbulence. See how every woman eventually becomes her mother – even if it kills her (and everyone around her). Visit the official website for Mother’s Daughter for more information and to purchase tickets. We can all use a little extra wisdom in our lives, so visit 12th century Jerusalem and learn important lessons from a man with a wealth of knowledge to share. Explore discourses surrounding love, religion and faith, and how to reconcile all three in times of disparity. Feel united with fellow theatregoers are you take the time to focus on and celebrate humanity. Visit the official website for Nathan the Wise for more information and to purchase tickets. Hildy Johnson had almost given up on his journalism career entirely, but that was before he met (and took in) a fugitive who he is determined to prove innocent. This play, which premieres at the Stratford Festival, was written by two former Chicago reporters who provide a thoroughly entertaining look at the industry – warts and all! Visit the official website for The Front Page for more information and to purchase tickets. Watch as two people, from different cultural and religious backgrounds, attempt to navigate their complex love, worldwide travel and the burden of a family secret that threatens to blow up everything they’re desperately trying to hold together. Visit the official website for Birds of a Kind for more information and to purchase tickets. You’ve heard of the brutal tragedy that struck Salem, Massachusetts – when justice gave way to greed and secrecy and allowed for the sacrifice of the innocent to run rampant throughout this seemingly bewitched town. See the story; its victims; and villains come to life in this historic tale of betrayal. Visit the official website for The Crucible for more information and to purchase tickets.